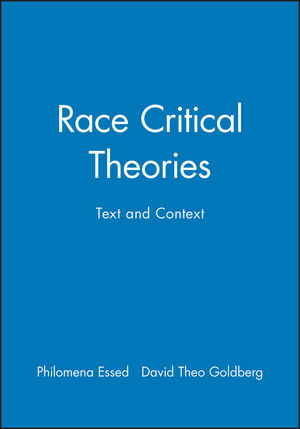 Race Critical Theories brings together many of the key contributors to critical theorizing about race and racism over the past twenty years. Each previously published text is accompanied by a fresh statement - in most cases written by the authors themselves - regarding the political context, implications and effects of the original contribution. Philomena Essed is Senior Researcher at the University of Amsterdam, Amsterdam Research Institute for Global Issues and Development Studies, and Visiting Professor at the University of California, Irvine. She is the author of Everyday Racism (1990), Understanding Everyday Racism (1991), and Diversity: Gender, Color and Culture (1996). David Theo Goldberg is Director of the University of California Humanities Research Institute and Professor of African American Studies and Criminology, Law, and Society at the University of California, Irvine. He is the author of Racist Culture: Philosophy and the Politics of Meaning (1993); Racial Subjects: Writing on Race in America (1997); and Ethical Theory and Social Issues (second edition, 1995). He co-edits Social Identities: Journal for the Study of Race, Nation and Culture. Introduction: From Racial Demarcations to Multiple Identifications (David Theo Goldberg and Philomena Essed). Part I: Conceptual Mapping, in Chronological Order (c. 1980-2000). 1. Imaginative Geography and Its Representations: Orientalizing the Oriental (Edward Said). 2. Race, Articulation and Societies Structured in Dominance (Stuart Hall). 3. Education and Liberation: Black Women's Perspectives (Angela Y. Davis). 4. A New Approach to the Study of Racism (Martin Barker). 5. The Genealogy of Western Racism (Cornel West). 6. Of Mimicry and Man. The Ambivalence of Colonial Discourse (Homi Bhabha). 7. Racial Formation (Michael Omi and Howard Winant). 8. Preface to Dominance Without Hegemony. History and Power in Colonial India (Ranajit Guha). 9. Defining Black Feminist Thought (Patricia Hill Collins). 10. Everyday Racism: A New Approach to the Study of Racism (Philomena Essed). 11. Cartographies of Struggle: Third World Women and the Politics of Feminism (Chandra, T. Mohanty). 12. The Nation Form:History and Ideology (Etienne Balibar). 13. Turning the Tables: Antisemitic Discourse in Post-War Austria (Ruth Wodak). 14. The end of Antiracism (Paul Gilroy). 15. Black Matters (Toni Morrison). 16. Modernity, Race and Morality (David Theo Goldberg). 17. Denying Racism: Elite Discourse and Racism (Teun A. van Dijk). 18. Whiteness and Ethnicity in the History of 'White Ethnics' in the United States (David Roediger). 19. Affirmative Action and the Politics of Race (Manning Marable). 20. A Bill of Rights for Racially Mixed People (Maria Root). 21. Racial Histories and Their Regimes of Truth (Ann Stoler). 22. Cultural Pluralism and the Subversion of the 'Taken-for-Granted' World (Maria Markus). Part II: Reflections, in Thematic Order (1999-2000). 23. Reflections on 'The Nation Form: History and Ideology' (Etienne Balibar). 24. Reflections on 'Racial Histories and Their Regimes of Truth' (Ann Stoler). 25. Reflections on 'Modernity, Race and Morality' (David Theo Goldberg). 26. Reflections 'Of Mimicry and Man. The Ambivalence of Colonial Discourse' (H. Bhabha and Kim Benita Furumoto). 27. Reflections on 'The Genealogy of Western Racism' (C. West and Howard McGary). 28. Reflections on 'Imaginative Geography and Its Representations: Orientalizing the Oriental' (E. Said and Saree Makdisi). 29. Reflections on 'Black Matters' (T. Morisson and Suzette Spencer). 30. Reflections on 'Defining Black Feminist Thought' (Patricia Hill Collins). 31. Reflections on 'Race, Articulation and Societies Structured in Dominance' (Stuart Hall). 32. Reflections on 'Racial Formation' (Michael Omi & Howard Winant). 33. Reflections on 'Everyday Racism' (Philomena Essed). 34. Reflections on 'Cultural Pluralism and the Subversion of the 'Taken-for-Granted' World' (Maria Markus). 35. Reflections on 'The New Racism' (Martin Barker). 36. Reflections on 'Denying Racism: Elite Discourse and Racism' (Teun A. van Dijk). 37. Reflections on 'Turning the Tables: Antisemitic Discourse in Post-War Austria' (Ruth Wodak). 38. Reflections on 'Whiteness and Ethnicity in the History of 'White Ethnics' in the United States' (David Roediger). 39. Reflections on 'Affirmative Action and the Politics of Race' (M. Marable and Johanna Fernandez). 40. Reflections on the 'Perface' to 'Dominance Without Hegemony' (R. Guha and Kelli Kobor). 41. Reflections on 'Cartographies of Struggle: Third World Women and the Politics of Feminism' (C. T. Mohanty and Sue Kim). 42. Reflections on 'The End of Antiracism' (P. Gilroy and Vikki Bell). 43. Reflections on 'A Bill of Rights for Racially Mixed People' (Maria Root). 44. Reflections on 'Education and Liberation: Black women's Perspectives' (Angela Y. Davis). Showcases the key critical readings on race and racism. Includes a new contextualizing essay by the original author of each classic piece. Features luminaries such as Edward Said, Stuart Hall, Toni Morrison, Angela Y. Davis, Cornel West, Homi Bhabha, Ruth Wodak, and Howard Winant.